All Products > "53983 Tamiya Lightly Tuned Motor 28 Turn"
This new electric motor is perfect for installing into M-03 & M-04 chassis to participate in official Tamiya races. 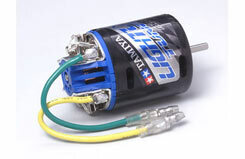 It provides more torque than the normal RS-540 type motor, and can sustain its high performance for long durations. This motor is also compatible with touring car chassis and is a great upgrade for beginner drivers to let them gradually adjust to higher performance motors. May be used with ITEM 53581 Racing Motor Brush and ITEM 53486 Commutator Cleaning Brush Set.